River discharge might sound complex, but it is actually just a measurement of the volume of water that flows in a river every second. We can chart these measurements out as cumecs (cubic metres per second) on hydrographs. It is worth noting that they usually only tell us how the discharge changes over time. If we look at a hydrograph from left to right, then the first thing that we can see on a hydrograph is the lag time. 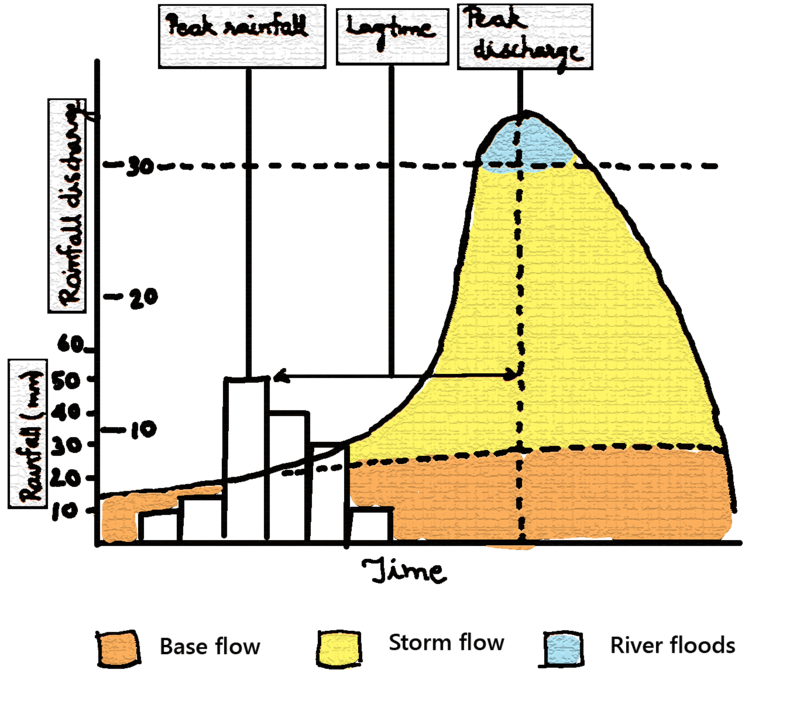 This is the delay that occurs between peak rainfall and discharge. Lag time occurs because of the delay between rain falling and water entering the river. The second thing that we can see on a hydrograph is called the rising limb. This sits between peak rainfall and discharge and it shows us an increase in river discharge. This occurs because of rainwater that is flowing into the river. The third thing that we can see when we look at a hydrograph is the peak discharge level. This is the highest point that is mapped out and it shows us the highest discharge. It is worth noting that hydrographs track changes over time, so you can only see the peak discharge for the period that you are looking at. The fourth thing that we can see when we look at a hydrograph is the falling limb. This is the opposite of the rising limb and it shows us the river returning to a normal level. When rivers do flood, there are a number of different factors that could have caused the flooding to occur. Naturally, an increase in river discharge has to be present, but what causes that increase? If rainfall becomes heavy, then the level of discharge present can increase quickly. This makes it more likely that a river will spill over its banks. The same could be said when it rains for long periods of time. Sometimes, the geology of an area can determine whether or not flooding is likely to occur. Some rocks are permeable and others are not. When rocks are impermeable, the water runs off of them. This causes a rapid increase in discharge. Have you already looked at our article about the river valley? If you have, then you will have seen our cross profiles. In the upper course, the sides of the valley are usually incredibly steep. This means that water enters the river much quicker than it otherwise would, causing discharge to increase rapidly. Actions can be taken to prevent flooding before it occurs and deal with flooding after it has occurred. We refer to these things as hard engineering and soft engineering. Hard engineering involves creating man-made structures that can be used to try and control the flow of rivers and prevent flooding. Flood relief channels are usually built to divert water. They usually carry water away from important areas. They can be used to reduce river discharge and some have gates that can control when water is released. Unfortunately, where the relief channels re-join rivers, there will be increased river discharge and this could cause flooding there. Channel straightening involves straightening the course of a river. This means that things like meanders can be cut out during the process. This leads to water leaving an area quickly because it doesn’t have as far to travel. Unfortunately, this can cause flooding to occur downstream because of the amount of water that is carried there quickly. Embankments are one of the easiest to recognise flood defence systems because they involve walls that are built right along the river banks. Naturally, their presence means that a river can accommodate more water without flooding. It is worth noting that they are quite expensive to build and if they break, the level of damage caused could be devastating. Reservoirs and dams usually come hand in hand. We regularly build dams across rivers, but reservoirs form behind them. They can be incredibly useful during periods of prolonged rain, but they can also be used when there are water shortages. Naturally, dams are expensive to build and they result in the loss of the ecosystems that could be found there. Preparing for floods is quite possibly one of the best days of dealing with them. If you have a plan to deal with a drastic event, then you know what to do when they occur. For example, a lot of people keep their essentials in a handy place. If buildings are also modified, then less damage will occur. It is worth noting that preparing for something does not mean that you won’t be affected by it. If you currently live in an area that is susceptible to flooding, then you will probably have heard flood warnings in the past. These are issued by the Environment Agency across different platforms and they give people time to move their possessions and minimise damage. Remember that these are not preventative and flooding will still occur. Planting trees might sound like an odd way of preventing flooding, but it actually works really well. They are able to intercept some of the water that falls from the sky before it reaches the river. This increases lag time and reduces river discharge. Naturally, this does mean that less land is available for agricultural purposes. If we know that an area is susceptible to flooding, then we can set up flood plain zones. These prevent people from building in areas that are likely to flood. This reduces the amount of damage that could be caused. It also reduces the risk of flooding because there are less impermeable materials for the water to run off.